COLUMBUS, OH — In the scramble for bids that took place at the Elite-Select Challenge in Columbus, it’s easy to lose sight of the assessment of team performances. With little season left for refinement, teams are starting to reveal their true identities. Here’s what we learned about the competitors at ESC. When it came to complete performances, Seattle Sockeye clearly stood out from the rest of the field. An uninspiring set of pool play opponents notwithstanding, Seattle had few blemishes. Sockeye was never truly challenged on the weekend and, in particular, showed off some impressive defense. They created chaos for opposing offenses better than any other team at the tournament, forcing indecision and high stall prayers on a regular basis. Their reset defense was especially good. And after the turn, they consistently scored. While Hogan thinks Seattle can do a better job starting games the right way, he was pleased with Sockeye’s Sunday performance when they downed Madison Club and Condors in games that were never close. In the final, Seattle took apart Condors’ offense early, using great pulls to set up match-up looks that usually used a player sagging off in the lane to take away unders and disrupt the Condors’ flow. Hogan had high praise for Seattle’s crop of rookie defenders: John Randolph, Derek Mourad, and Zach Goulson. A particular defensive sequence by Randolph, during which he earned two blocks, including catching up to his matchup going deep and then blasting off 70 yards for a bookends score, stood out in the 13-6 final. There are still plenty of questions about how Sockeye will perform against elite teams. But they have very clearly taken a lot of the hard earned lessons of the past year and dialed in their focus. They don’t have a super demanding schedule leading into the series and, in a season where elite teams and players are competing at a very high volume, some time away from tournament travels will give Seattle plenty of time to continue to build their chemistry and get mentally prepared for the series. Hogan wasn’t complacent after their tournament victory. A round robin tournament in Tacoma against Furious, Rhino Slam, and Street Gang will give Sockeye a cursory look at their regional opponents. Where Sockeye will stack up against the tried and tested contenders this season still remains to be seen, but Sockeye showed some clear growth since Pro-Elite Challenge, and they’ll have plenty of time to fine tune their systems before the games that matter in the series. Easily the second best performance of the tournament came from SoCal Condors. After a solid but inconsistent showing at Pro-Elite Challenge, Condors were able to get in more practices and shifted around key personnel to beef up their D-line offense. On Saturday, those personnel shifts and some dedicated pre-tournament scouting paid off with a big win against Pittsburgh Temper and late comeback wins over Philadelphia Patrol and Durham Turbine. In what was probably the biggest upset on Saturday, Condors were able to break down Pittsburgh’s offense and take away the isolation spaces that Temper likes to create. Condors were efficient and precise, particularly in situations where they had to tighten up and come back to win against Patrol and Turbine. In the semifinals, they smashed GOAT 13-8 in a game that they seized control of early with two opening breaks. Condors employed a 3-3-1 zone look all weekend that took an understaffed GOAT team out of their comfort zone and forced key errors out of an experienced backfield. Condors’ run ended in the final where they came up against Sockeye’s elite defense. Travis Dunn was a particularly impressive piece of Condors offense, using his 6’3” frame and a healthy arsenal of throws to frustrate matchups the entire weekend. Dunn, a rookie this season for Condors out of Arizona State, is representative of the kind of player that the Condors has been working to integrate into the team over the past three seasons since the merger of players from Los Angeles and San Diego. Sean McDougall, Jeff Silverman, and Scott Radlauer were a few of several key contributors to Condors’ success and represent a perfect cross section of what Condors has been building towards since 2016. With a solid performance this weekend, Condors should be secure in their hunt for a bid. Meanwhile in Pool C, Madison Club performed well, especially given what appeared to be considerable limitations at the start of the tournament. Coming off of the AUDL Championship Weekend, Madison brought a smaller squad of 17 players and was missing their coach Tim DeByl, who was understandably on vacation. A slow start against Mockingbird, in which Madison had to rally from behind to win, did not prove to be fatal. Madison took care of business against Prairie Fire and proceeded to deliver a convincing 13-10 win against Chicago Machine. Mad Club’s accomplishments were perhaps all the more impressive because of their strict adherence to a new team-wide policy. Three players who had made less than 75 percent of Madison’s practices had to sit one game, narrowing the roster down to 16 per game on Saturday. A lot of what Madison has been doing in club and the AUDL was based on their disappointing finishes last year. Madison used a variety of different looks to earn break opportunities, including trapping Machine with a big four-person cup and attacking in transition to exploit their height and athleticism mismatches. While they did suffer slow starts against Mockingbird and Machine, Madison was great at closing games. They completely flipped the script against Machine in the second half, overcoming a 7-6 deficit to get on serve and eventually shut the door on Machine after a drop from Pawel Janas yielded a 12-9 advantage. Despite a substantial 13-6 loss to Sockeye in the semis, a sign of work yet to do, Madison Club pounded on a shorthanded Toronto GOAT in the third place game 13-9. Despite locking up a spot in the semifinals by earning the point differential they needed to win a three way tie in Pool D, Toronto GOAT looked burnt out and a bit lethargic outside of their win against High Five. There were some good individual performances–particularly from Andrew Carroll, Mike MacKenzie, and Geoff Powell–but GOAT clearly lacked the cohesion and focus necessary to get the job done this weekend. They were missing a lot of key players including Isaiah Masek-Kelly and Adrian Yearwood, and the team in general could probably benefit from some time off before the series. GOAT looked particularly flustered when faced with the zones from Chain Lightning and Condors. Their downfield matchup defense didn’t create a lot of pressure against Condors offense, and there was noticeable frustration as GOAT struggled to adjust its mindset throughout the game. They are expected to debut at #19 in the USA Ultimate rankings, a poor showing for a team that will have to face the likes of PoNY and DiG at Regionals in what could be a game of musical chairs with only two bids. Despite missing six players due to injuries, Machine was arguably the best team in pool C until their second half collapse against Madison Club. Kurt Gibson, Pawel Janas, and Travis Carpenter looked great controlling Machine’s offense, but a lapse in focus as the wind picked up set Madison up to steal the chance to face Sockeye in the semis. That blemish on an otherwise impressive run showed that there is still some growth remaining for Machine, including finally being able to field a complete team. Meanwhile, the other Great Lakes squad in bid range, Michigan High Five, showed a little inconsistency that nearly cost them a game against Seattle Voodoo and saw them get blown out by GOAT. But they shut the door on Patrol in consolation and survived a close game to Chain Lightning that gave them some edge in the rankings. 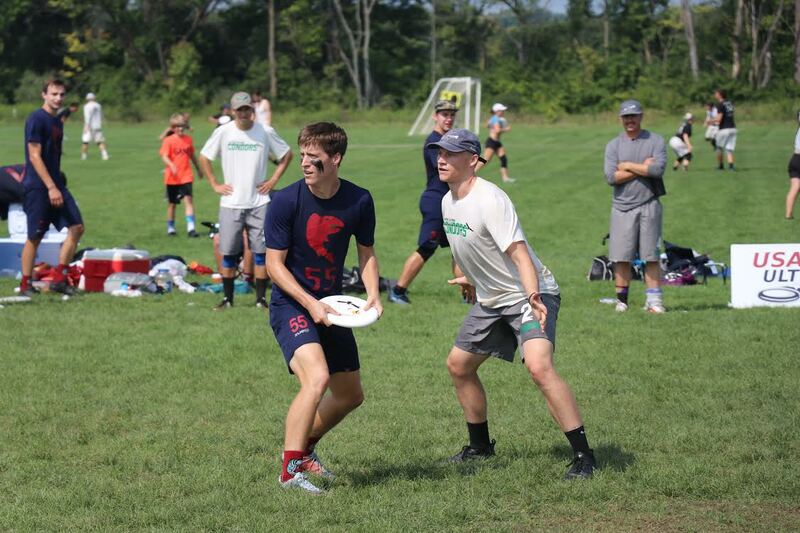 A healthy Joe White was one of the most impressive players at the tournament, and High Five still has plenty of the pieces that have kept them going to Nationals. Still, though, their inconsistency on offense should be a serious concern. By far the biggest winner out of Pool D was Atlanta Chain Lightning. Coming into the weekend, their path to earning a strength bid looked like an uphill climb with High Five and GOAT headlining their pool. They had an ominous start to the weekend when JP Burns came down hard on his knee only a few points into their first game against High Five. But Chain Lightning rallied strong and notched three big wins in the bid picture against GOAT, Seattle Voodoo, and Temper. They utilized an effective 2-3-2 zone look that was particularly useful in their 13-9 win over GOAT. Chain Lightning just barely missed out on a shot at the semis in a three way tie but they did what they needed to do this weekend and have plenty of reason to be looking forward to a two-bid Southeast Regionals. Temper and Patrol looked a bit shaky this weekend. Patrol is still in the process of putting the pieces together with lots of new players. They barely survived a first round run by Durham Turbine that culminated in a double game point finish, and they dropped close games to Condors and Temper. Their results stuck them outside of bid range and, given their inconsistency, they won’t be the favorite in the Mid-Atlantic come Regionals. But MA rival Temper–coming off of a great showing at the Pro-Elite Challenge–also flashed some vulnerability this weekend. Temper’s offense did poorly against a well-prepared Condors defense, and they also struggled to convert breaks. In what could prove to be a preview of the Mid-Atlantic Regional final1, Patrol and Temper squared off during the final round of pool play. It was a long, sloppy game as wind and rain picked up toward the end of the second half. No team led by more than two until Temper finally closed out a 13-10 win. Temper’s performance certainly casts some doubt on their emergence as a top club program this season. They simply didn’t show the polish or focus that characterized their performance at Pro-Elite. The Mid-Atlantic now sits with just a single bid. Both Patrol and Truck Stop will be in action over Labor Day weekend at the Pro Championships, and they’ll hope to do enough to get an extra bid (or two). Comments on "Elite-Select Challenge 2018: Tournament Recap (Men’s)"